Jeremiah Englehart’s recent successes are more than 30 years in the making. The 41-year-old conditioner grew up working underneath his father, leading Finger Lakes trainer Chris Englehart. After branching out on his own in the mid-2000s, he has been racking up stakes wins ever since. Despite the fact that his operation is based in New York, Englehart himself was born in Pennsylvania during a Penn National meet. “All [six] kids were involved in the horses when they were young. Most still are,” said Chris Englehart. Jeremiah worked alongside his father from an early age. “I used to–when I was six, seven years old–go in, put the food in the feed tubs, do the water buckets. I’ve always worked for my dad; I’ve worked probably about 20 years for him,” he recalled. His mother, Sheila, ran the shedrow, and young Jeremiah shadowed his father. “But I learned a lot from my dad as far as how he treated every horse individually and how he got to bring the best out of every horse, whether it’s how he trained it or how he took care of it and how he just looked after it in general,” he added. Englehart graduated from Alfred State College with an associate’s degree in business marketing, then enrolled in Rochester Institute of Technology. The siren song of the racetrack, however, proved irresistible. He made his way back to the track by doing part-time work for his father again. “Then my brother and I bought a horse and started doing well with the horses that we bought, so then I dropped out of school,” he said. O’Grady and Englehart later teamed up on 2015 Private Terms S. winner Bridget’s Big Luvy. After his initial solo foray didn’t succeed, Englehart returned to home base. Several years later, after building on his success at Finger Lakes, Englehart made the downstate trip to Belmont Park. His biggest win thus far came in 2013, when he trained Ria Antonia to a win via disqualification in the 2013 GI Breeders’ Cup Juvenile Fillies, earning the 2-year-old filly divisional championship honors. 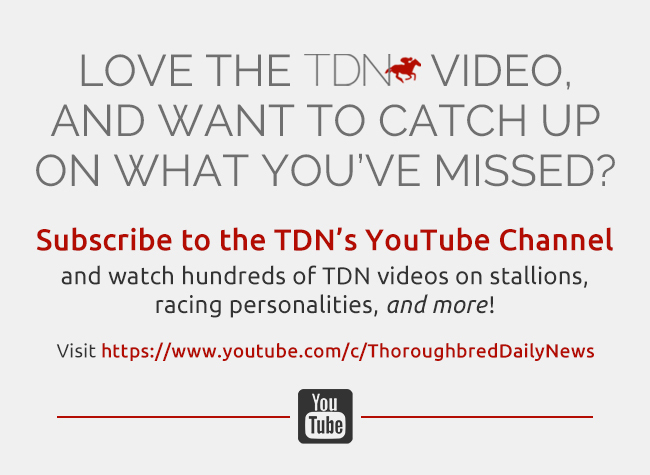 Englehart’s passion for the horse and open demeanor have earned him a list of devoted clients, both old and new. Currently, Englehart’s stable contains between 165 to 170 horses. At Belmont alone, he has 60 head, topped by the 75 he keeps at Finger Lakes. For Nicolai, Englehart sent out undefeated juvenile filly Sue’s Fortune, who took the Aug. 11 GII Adirondack S. at Saratoga. For Orlando DiRienzo and Southfield Farm, Englehart conditioned Indy’s Lady, a two-time stakes winner last year. He sent out Neal Allread’s 3-year-old filly Baby Boss to annex the April 21 New York Stallion S. at Aqueduct. Englehart has adapted to meet the commercial needs of his clientele. 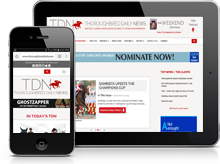 In addition to helping select prospective purchases, Durr breaks 30 to 40 of Englehart’s young horses per year, while Jim Crupi of Crupi’s New Castle Farm breaks another 20. Though he works primarily with Durr to select horses, Englehart collaborated with Phil Hager of Taproot Bloodstock to purchase a filly named Majestic Won. Now three years old, the daughter of Majestic Warrior races for August Dawn Farm, the homestead of legendary NFL coach Bill Parcells. 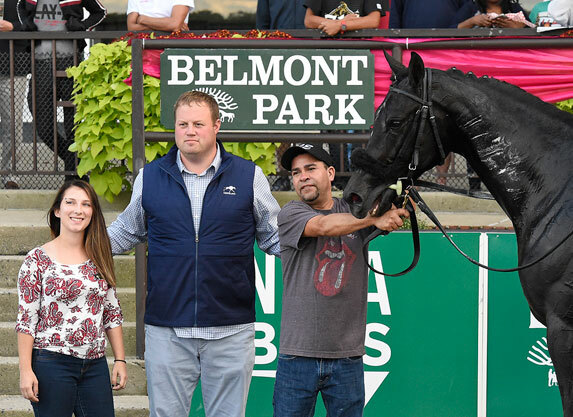 “The Big Tuna” and Englehart most recently hit the winner’s circle with 2-year-old Forty Under, who captured the Sept. 29 GIII Pilgrim S. at Belmont Park. Amidst the highs and lows of stakes wins and injuries, Englehart manages to maintain an active home life with wife Robin and their family. “I’m very lucky. My wife, she handles 99.9% of everything at the house,” he said admiringly. This past year, the Engleharts moved to Saratoga–simplifying Jeremiah’s travel to both Belmont and Finger Lakes–full-time. “My business was taking more of a swing towards NYRA and I wanted to devote more of my time towards my NYRA horses,” he said. Saratoga also offers excellent educational and recreational opportunities for his five children: daughter Raelyn, twins C.J. and Anna, and sons Eli and Jax. Unsurprisingly, the next generation of Engleharts–all under 10 years of age–is horse-crazy.